Since 2007, I have been working an extensive side project that combines two of my favorite things in life; Paleontology and Pokemon. Basically, it was pokemon that was directly inspired from actual paleontological animals. It was originally supposed to be a fanfic where ancient pokemon were coming through time portals and the protagonist had to figure out why it was happening before major damage happens. However, the story was so big that I didn’t have the time or patience to do it. The idea also resurfaced again years later when I came up with the notion of having my ancient fakemon in an RPG. It too didn’t work out. But the results of my hard work did not fade away; I had kept many entries where I meticulously wrote tons of data on these ancient fakemon. Now that I have a blog, I thought now was probably the best time to show the world these creations. Starting today, I will publish a post describing an ancient animal (what is it, why I like it, any interesting tidbits) and its inspired fakemon (typing, stats, moves, their initial roles in the storyline and such). These posts will only be released on Fridays, however, not every Friday will have an Ancient Fakemon post. I hope you enjoy them. And brother, I think I picked a good one to start with. I can’t explain why exactly, maybe it’s the soulless eyes, maybe it’s it terrifying appearance, or maybe it’s something else entirely. Whatever the case, I do not want to be in the water if this fish is swimming about. Dunkleosteus terrelli is a placoderm, a relatively successful group of bony armored fish that dominated the seas during the Devonian Period. This unique group of animals died at the end of the Devonian Period leaving no modern day relatives. They are classified by their armor plated body structure which gave them protection at the sacrifice of speed. Most of them were bottom dwellers and clung to the seafloor. The Arthrodirans, a group within the placoderms, escaped the seafloor and actively swam in the water column. Dunkleosteus is one of those Arthrodirans. 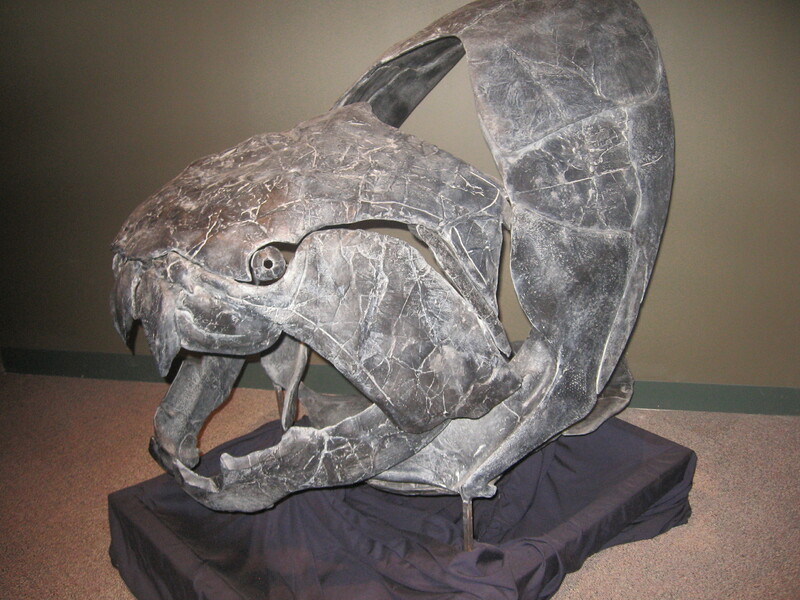 The largest placoderm discovered; Dunkleosteus could reach up to 10 meters in length. Its “teeth” were not traditional teeth like you and I have but modified bone that functions as teeth. The blade-like “teeth” could continuously sharpen as the predator was feasting on its prey which is pretty wild. Dunkleosteus status as the top predator in the seas is well founded due to its size and biting behavior. Anderson and Westneat (2009) estimated that Dunkleosteus could open its huge mouth in about 60 milliseconds. This rapid expansion created a vacuum which sucked water and prey into its mouth. Once the prey was in its mouth, Dunkleosteus would then crush or pierce its prey from as high as 6170 N at the tip of the mouth to a staggering 7495 N at the back of the mouth (for reference, we can only bite at 294 N at the tip of our mouths). This bite force is so large that only the great white shark and the alligator can match it (see Huber et al. (2005) for a general list of animal bites and Wroe et al. (2008) for shark bites). Both of these methods meant that Dunkleosteus was feeding on prey that was both elusive and armor-covered such as ammonoids, arthropods, and other placoderms (Anderson and Westneat 2009). Dunkleosteus has shown up a few times in pop culture. The first time I saw him was actually in the second Dinotopia book, The World Beneath, where the armored fish snapped off the claw of the protagonists’ underwater ship and briefly fought a Kronosaurus. 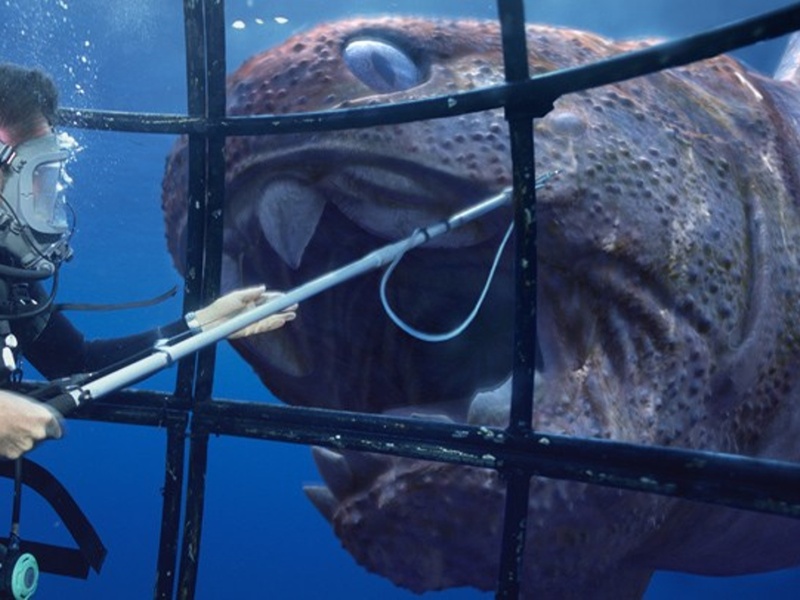 The second time I saw him was again in Dinotopia only this time it was in the tv movies (where he was also terrifying albeit more angler fish-like). Dunkleosteus most famous appearance would probably be in the BBC’s Sea Monsters where Nigel Thornberry Marven journeyed to the seven deadliest seas in Earth’s history. Dunkleosteus and his Devonian Sea was ranked the Fifth Most Deadly Sea. Nigel wanted to interact with a Dunkleosteus so he got into a round shark cage and tried to get a closer look at the fish. Special Moves: Shear Bite: Steel Type, Power: 40, PP: 20, Accuracy: 100%. Sheer Bite raises the user’s Attack by one stage after damaging the opponent. Pokedex Description Version One: Scientists can tell how old a Clunklesteel is by the amount of rust that grows on their backs. Pokedex Description Version Two: Clunklesteel have been known to ram small boats and even pierce the hulls using their steel-bladed teeth. Basic Background: Clunklesteel is based off of Dunkleosteus. Clunklesteel was one of the easiest fakemon to come up and play around with. The armor nature combined with his fish status means he makes a great Steel/Water type pokemon. The Ability Strong Jaw also fits perfectly with his terrifyingly biting force. His famous chompers means that biting moves like Crunch or Thunder Fang are great compliments to him. Clunklesteel’s nature means he has great Defense and Attack at the cost of his Speed and Special Attack. Shear Bite is a move made specifically for Clunklesteel. The continuously sharpening of his blade-like chompers fits well as a move. Shear Bite is the Steel Type version of Power-Up Punch. Clunklesteel played an important part in my story. Originally, the protagonist had met a Clunklesteel when he was a kid and was traumatize by it and has since been afraid of the ocean. The same Clunklesteel had come back when the protagonist unknowingly released it and a bunch of other prehistoric animals at a terrorist facility. The Clunklesteel began to hunt him relentlessly and violently defeated the protagonist at every battle they met. Each time, he was too scared to act confidently in the face of his feared foe. One of the battles even cost him his pokemon. It wasn’t until near the finale of the story when the protagonist had finally faced his fear, defeated it, and captured the placoderm pokemon. I always imagined him as being a mindless machine and with this design that my girlfriend came up with, that mindless machine really shined through. Don’t think, just eat and go, eat and go. Finally, Clunklesteel evolves from Sillylepis (formerly Placoderp before that term became controversial) and is based off of Silurolepis, a primitive placoderm found in the Late Silurian. Sillylepis evolves at level 20 to Clunklesteel and is similar to Magikarp due to both having poor stats and a poor moveset. I hope you enjoy the first Ancient Animals and Their Fakemon! When time permits, I’ll make more of these later. Anderson P.S.L., Westneat M.W., 2009. A biomechanical model of feeding kinematics for Dunkleosteus terrelli (Arthrodira,Placodermi). Paleobiology. 35:251-269. Huber D.R., Eason T.G., Hueter R.E., and Motta P.J., 2005. Analysis of the bite force and mechanical design of the feeding mechanism of the durophagous horn shark Heterodontus francisci. The Journal of Experimental Biology. 208:3553-3571. Wroe S., Huber D.R., Lowry M., McHenry C., Moreno K., Clausen P., Cunningham E., Dean M.N., and Summers A.P. 2008. Three-dimensional computer analysis of white shark jaw mechanics: how hard can a great white bite? Journal of Zoology. 276:336-342. 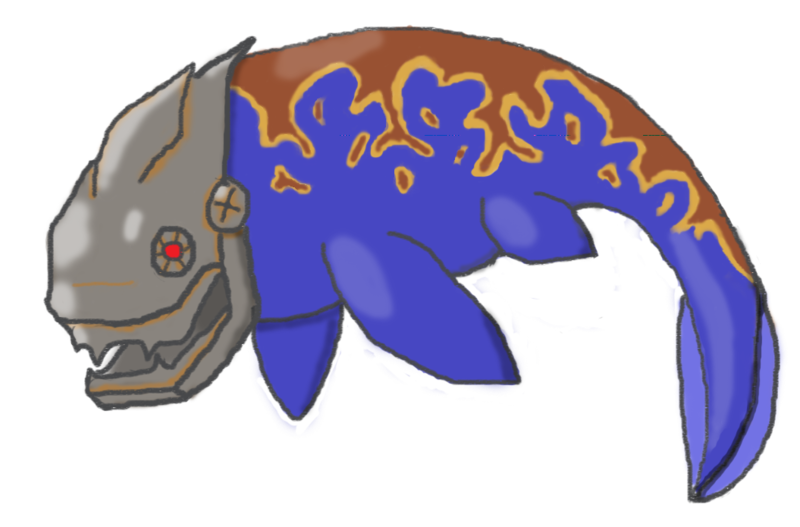 This entry was posted in Ancient Animals and Their Fakemon, Pokemon and tagged Devonian, Dunkleosteus, Fakemon, Paleontology, Placoderm, Pokemon on May 9, 2014 by Andy.